Sick of looking at concrete, no green space of your own? If you hanker for some green space, or just something different, glamping is your answer. A word melded from camping and glamorous, the promise is of getting your own space in nature with comfort, uniqueness and without the hassle of carrying your home and everything that goes with it, on your back, or in most cases in your car. Glamping comes in all shapes and sizes. What’s right for you is all about what kind of escape you’re looking for and who with be that family, friends, kids or the dog! Camping demands a fair amount of paraphernalia, not always easy to transport or store which is probably why its often left behind after a weekend away. This throwaway approach doesn’t quite fit with the celebration of the outdoors and nature that camping attracts. Glamping solves all of this. It offers comfort, ease and the privacy and uniqueness that so many of us crave. Why camp if you end up rammed next to people you neither want nor planned to be sharing your well earned holiday time. Even less so share a loo or a shower alongside them. Short breaks are popular, quick getaways and gatherings with extended family and friends or to celebrate significant birthdays has made glamping a great choice. 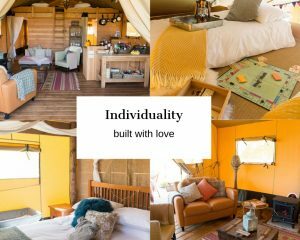 What types of glamping accommodation are there? 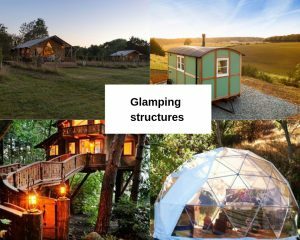 There are as many types of glamping accommodation. What started out as simple structures like bell tents has evolved into flights of fantasy. Yurts, are what many envisage when they think of glamping. The more exotic and natural a structure is, lends itself to glamping. The promise of an escape to nature. More ‘self-catering’ experiences aimed at couples such as shepherds huts and pods have been popping up everywhere . These smaller structures limited in space are quaint getaways. Some have a really high level of finish with underfloor heating, kitchens and roll top baths. They are perfect for a short couples getaway – but this limited amount of space for too long might give you cabin fever. For a weekend or are popular for one night stop offs between activities like mountain biking, or hiking or for anglers. Canvas structures give a hint to the origin of glamping, camping. They have evolved to offer comfort and luxury including wooden floors, proper beds, kitchens wood burners, bathrooms and a lot of space. How do they differ? Yurts and tepees and safari tents are all good choices, but think about whether you want to share an open plan sleeping space with the whole family. Safari tents offer separate sleeping quarters and even bathrooms, which is definitely a plus for extended family groups and friends. Whilst in tepees, yurts, bell tents and domes living, sleeping and cooking are in one space. More recently structures have become more unique and one off with a massive surge in tree houses and converted structures. Tree houses can be anything from unique and extraordinary to very finished and almost ‘apartment’ like in look and feel. They give people a new perspective on the world, high up in the canopy. There are some structure which ‘hint’ at being tree structures, but which are simply on stilts. So make sure you get the authentic experience if you pay for the often high price of getting there. The whole idea of glamping is to get close to nature ‘in comfort’. So beware of the over done mass produced sites as it can end up feeling like a caravan park, which can mean less space and less uniqueness. So when you are unplugged and left in a field to entertain yourself, what do you do? Well the world is your oyster really. 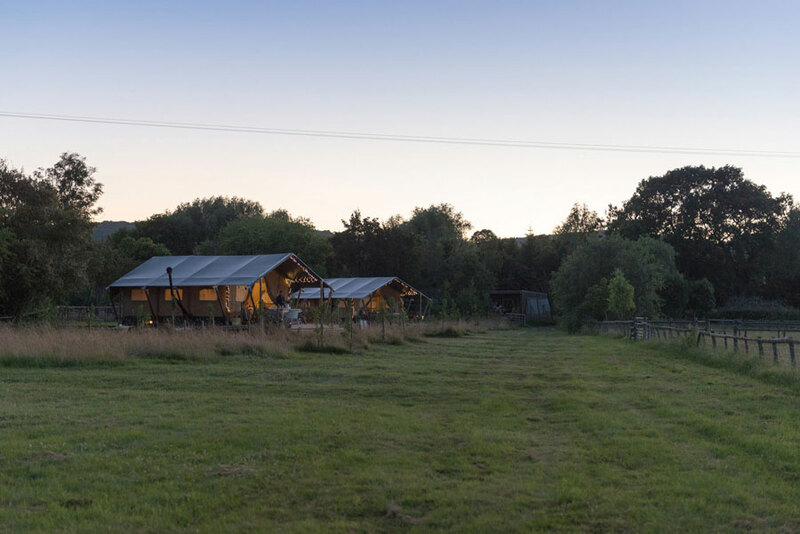 Many glamping sites offer activities and they can range from farm based animal feeding, to making your own beeswax candles. 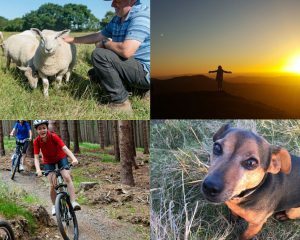 Activities which celebrate and immerse you in nature are the most popular –such as foraging, cooking over fire, wood working, outdoor bathing, all very sought after. The experience of bathing outside is growing in popularity. Wood burning hot tubs, out door baths and showers and now saunas are a real pull. There’s nothing like soaking under the stars. Here at Upsticks Glamping we are developing our very own ‘wilderness spa’ which offers the chance to get outdoors, soak, and get treatments in a private shepherds hut. Experiences match the areas you choose to visit: Beach, Mountains, Rivers, Lakes, all have a lot to offer. Beaches are always popular, but as glamping offers the chance to immerse yourself in nature, its good to think about visiting somewhere you don’t normally go, and trying activities you’ve never done before. I find visitors marvel at what I think are everyday things like feeding the chickens, or watching wildlife. We offer glampers bikes to explore on, and dogs are welcome as the walking around us in the Malvern Hills is so lovely. But there is so much in the area for all ages and interests, from throwing a pot to 4×4 off-roading, and as we know the area we can point you in the right direction. I’d think about what you want from your stay. If you just want to switch off, so activities like walking cycling or picnics and exploring which don’t need a car are very popular. So check the on-site facilities to be sure you can decide to do nothing if you want – in my experience it is the most popular activity we have. A hammock beckons and the kids are safe running around with games, space and their imaginations to keep them busy. At night by a firepit always draws everyone together, to cook, and share stories – that is often enough. We happen to have a pub next door as well. What does luxury glamping look like ? What about WIFI – Most of us struggle without being connected. So be honest, if you want wifi then check if it’s available. You might not want to tell the kids, but at least you can search the area for activities, maps, access Google maps and contact home if you need to. Food – Some glamping sites have pantries or offer ready meals, we happen to have a pub within walking distance but some are very cut off. So check for facilities. Most times you can have deliveries arranged from super markets or here at Up Sticks Glamping we’ll make sure you have the basics like milk, bread, butter, juice and a bottle of wine. We provide all the spices, olive oil, salt, pepper, sugar, because that stuff is such a pain to pack and take on holiday. Bathrooms For some people the facilities must be en-suite or attached to accommodation. For others private is essential. Personally I’d draw the line at having to share – because that’s too much like camping. Think about how far it is to the bathroom, and whether you need wellies to get there. We have boardwalks connecting our safari tents to bathrooms, which means no muddy feet or boots plus they look lovely. Electric sockets are becoming more common – and the reality is we all need to plug in something from phones to bottle warmers. So be realistic. After all you chose Glamping to avoid the hassle of camping! What’s included? well we include everything that makes camping a chore. You don’t want to have to pack basics like salt pepper, herbs and ketchup. You certainly don’t want to have to take your own cleaning stuff or utensils. Upsticks packs all of that and more. For us we want you to arrive and unwind so there’s bread,eggs, marshmallows, ground coffee, tea, milk and sugar to cover breakfast, and a bottle of wine for the night shift. I am an owner and I love welcoming people to share our space. I love see them relax and unwind. I with my husband, son and daughter built the place and put my heart and soul into designing and sourcing the interiors. So when I welcome you it is with real joy. Glamping has become big business, with some sites being close to just big caravan parks, too many structures in too little space and not enough individuality. Decide on how authentic you want your experience. How unusual or unique you want your structures and interiors. This all adds to the experience of entering another world, which is what holidays are so often about.